Brainy Fil­ter for Open­Cart is a well thought out and excel­lently made mod­ule that allows fil­ter­ing prod­ucts by keywords, brands, prices, avail­abil­ity, rating, options and prod­uct attrib­utes. Brainy Filter looks beautifully and works on different devices. There is a high-grade HTML/CSS code that is easy to adapt to any custom design. The filter has been tested on Android, iOS, and Windows Phone devices. The filter works with responsive themes. 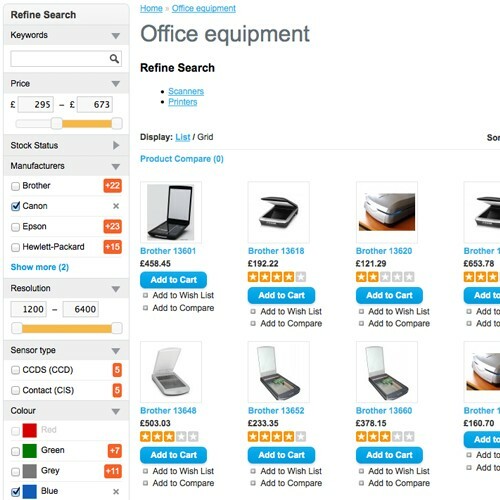 Filtering by keywords, price (taking into account taxes and discounts; the price range is defined automatically), manufacturers, options (including images), attributes, stock status, and rating. 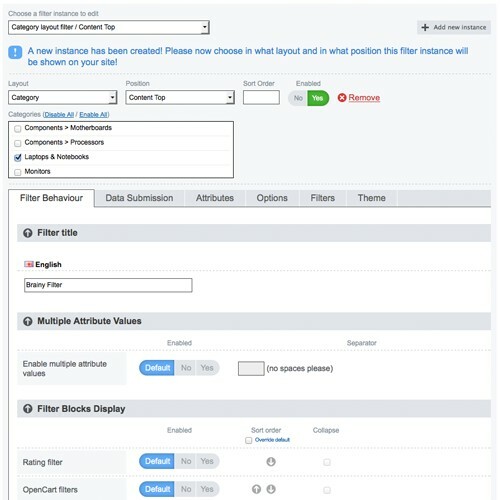 Ability to have the filter on different layouts. AJAX requests that don't reload the entire page. Settings to control the way attributes are shown (selectbox, set of checkboxes, radio buttons, slider). 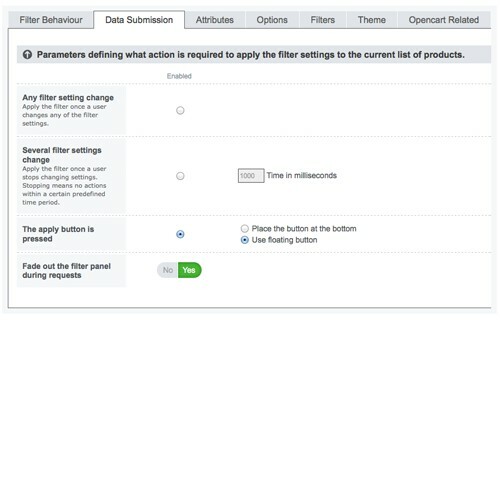 Filter submission options: 1) applying the filter once a user changes any of the filter settings; 2) applying the filter once a user stops changing settings; 3) applying on a button press (fixed or floating). 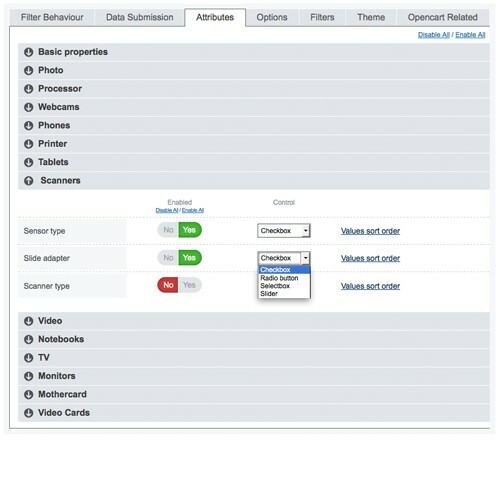 Ability to show products from subcategories in their parent categories. 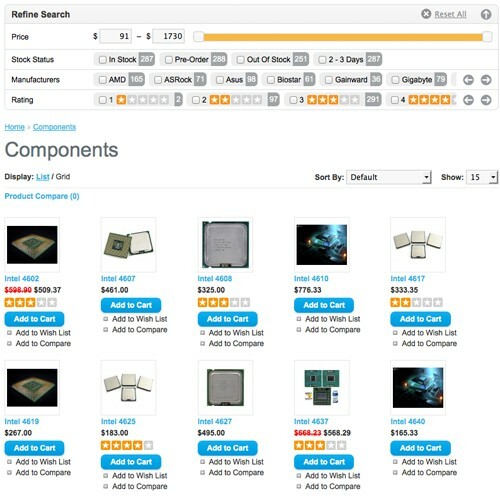 Improved OpenCart’s queries for receiving lists of products. Both extensions are awesome :) The Ultimate in addition provides ability to override settings separately for each layout and category and more frequent updates. 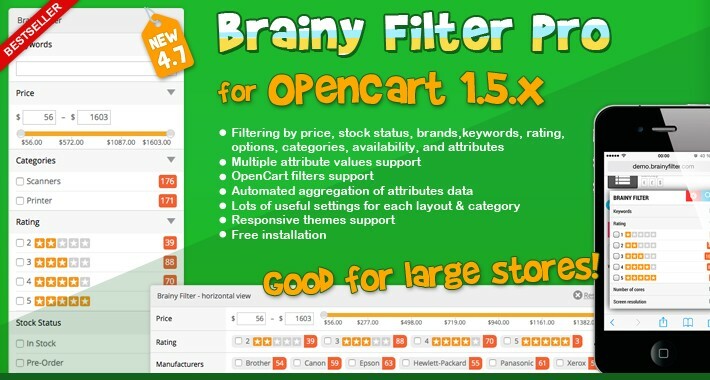 Make sure that the version of the Brainy Filter module you have is compatible with the OpenCart version you use. 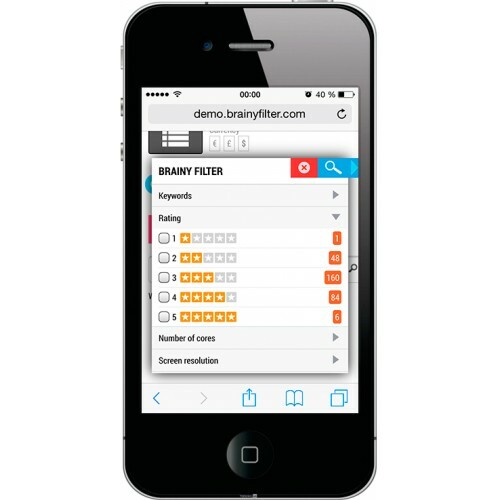 Install the Brainy Filter module zip-file through the Extension Installer section of your OpenCart. If during the installation you face an error (usually due to lack of write permissions on the server) unzip the module file and copy the content of the upload folder into the root of your OpenCart site. Go to the Extensions section (the Modules section if it’s OpenCart 2.3 or later), find Brainy Filter in the list of extensions and click on the “Install” icon. 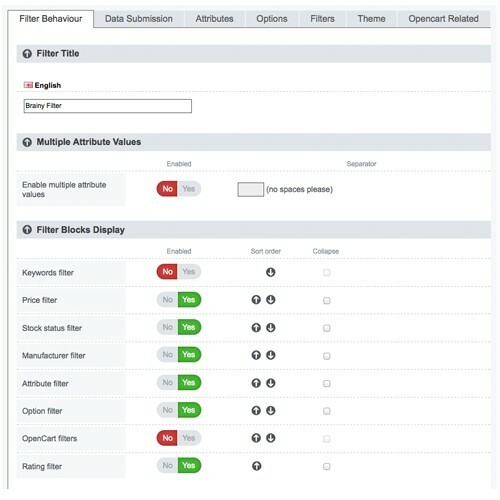 Open the filter control panel and make sure the default Brainy Filter layout has been automatically created (the Module Instances main menu item). If the default layout hasn’t been created double check that you are using the correct version of the extension that suits your OpenCart and try to re-install. 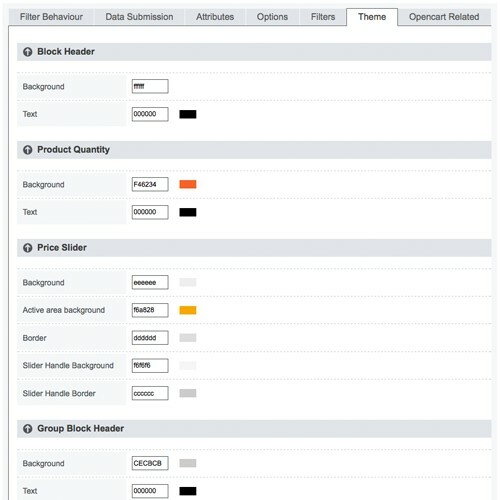 Create an instance for the layout you need (Categories, Manufacturers, etc.). Update modifications in the Modifications section of your OpenCart. (!) Before contacting the support please make sure you have read the installation guide and have done everything as required! Please also read our troubleshooting section! Note that we can only help with supported versions of OpenCart and properly made themes that suit the used OpenCart version. We can install and set up the filter only once. If you change the theme or reinstall OpenCart we will not be able to help again. (!) As of January 20, 2016 we stop providing support for MijoShop due to its unstable approach to embedding third party plugins. You still can use our plugin with MijoShop but it may be troublesome if you use MijoShop 3.x+.